HomeHealthShould I eat the same foods every day? October 30, 2018 Health Comments Off on Should I eat the same foods every day? 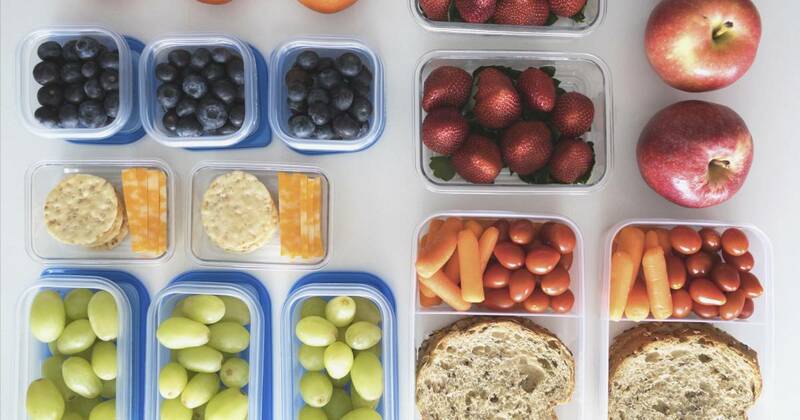 Search “#mealprep” on any social media platform, and you’ll likely find pictures of the same healthy meal laid out in perfectly portioned containers. Prepping meals at the beginning of the week is becoming increasingly popular for a variety of reasons — time, convenience and health, to name a few. But is eating the same thing everyday a good idea? Like most things in the nutrition realm, the answer isn’t black and white. Although all registered dietitians have their own nutrition philosophies, most can agree that eating nutritious foods is the key to achieving a healthy lifestyle — and that taking time at the beginning of the week to plan out your meals can make a big difference in how successful you are with sticking to a healthy diet. But is sticking to the same rotation of food combos doing us a disservice? We asked the several experts for their take on eating the same foods everyday. It creates healthier habits: Research suggests that people who practiced at least five healthy lifestyle habits throughout their life lived almost a decade longer than those who didn’t. Not surprisingly, one of those habits was practicing a healthy eating pattern, including getting the daily recommended amounts of vegetables, fruit, nuts, whole grains, polyunsaturated fatty acids and omega-3 fatty acids and limiting processed meats, sugar sweetened beverages, trans fat and sodium. The only problem is that many Americans find healthy eating to be an overwhelming task. “When forming new habits, it’s easy to get overwhelmed by trying to do too many things (or eat too many new foods) at once,” says Chelsey Amer, MS, RDN, CDN, virtual dietitian and creator of CitNutritionally.com. “To make it more accessible, I suggest learning how to prepare a few healthier foods you love, and stick with those until you’re ready to expand your repertoire.” Research by the American Heart Association implies that greater dietary diversity is associated with unhealthy eating habits, such as higher intakes of processed foods, refined grains and sugar-sweetened beverages and lower intakes of fresh fruits and vegetables. So if you’re still trying to establish a healthy eating pattern, it may pay off to start by choosing a few recipes to make consistently, and then slowly adding new foods from there. When there are a wide variety of foods available to sample, you may (inadvertently) delay feelings of fullness or satisfaction from your meal and increase the amount of food you eat. It may reduce calorie intake: Although calories are not the only important nutritional stat, they are a factor in weight and overall health. “Repeated exposure to the same foods has been found to reduce overall energy intake in women due to ‘food habituation’,” says Amer. She explains this phenomenon: “When there are a wide variety of foods available to sample, you may (inadvertently) delay feelings of fullness or satisfaction from your meal and increase the amount of food you eat.” For the 66 percent of American adults who are overweight or obese, eating the same foods everyday may help reduce their caloric intake. It can save money: It doesn’t take a scientist to prove that eating at home is cheaper than eating at a restaurant. We can all agree that a pasta dish doesn’t actually cost $15 to make like it does at your favorite Italian joint. But, there are many people who argue that healthy eating is too expensive, too. It may not be setting you back as much as you think: A meta-analysis found that nutritious foods only cost about $1.50 more per day than unhealthy foods. And that didn’t take into account the cost of eating out — so if you’re guilty of ordering delivery a bit too often, it could actually save you money to load up on healthy food for the week. If you’re someone who gets overwhelmed in the produce aisle and ends up haphazardly tossing ingredients into the cart, you may have some sticker shock at checkout. And if you aren’t able to get to all of your produce before it goes bad, that’s more money down the drain. In this way, focusing on a few kinds of produce, and using it to create meals throughout the week, is a smart way to ensure that you put all the produce you buy to work — and none of it ends up in the trash. It reduces stress: Have you ever scrolled through Instagram looking for dinner inspiration for what seems like hours, only to pick up the phone and order your usual? Figuring out what to eat three times per day can be exhausting, and stress can lead to uncontrolled and emotional eating. This is where having a few staple meals on rotation can help. “Eating the same thing everyday will definitely take the guess work out of choosing a meal, and it provides a routine,” says Kate McGowan, RD. Most adults already have enough on their metaphorical plate and not having to think about what to eat can reduce some stress in your everyday life and make it easier to stick to a healthy diet. Although eating the same thing everyday may sound like the simple solution to all your eating woes, it’s not without drawbacks. Experts agree that there are some cons associated with repetitive dietary patterns. It limits the nutrients you eat: Eating the rainbow is a simple strategy that dietitians teach children and adults alike. Consuming a wide variety of colorful fruits and vegetables ensures that you get an abundance of different vitamins, minerals and phytochemicals in your diet. “If you only eat orange vegetables, like carrots and sweet potatoes, you will be getting a good amount of fiber, vitamin A and vitamin C, but you will be missing out on vitamin K, folate and lutein found in dark green vegetables like kale or broccoli,” says McGowan. Not only that, greater variety of healthful food items has been associated with sustained weight loss. “I like to emphasize food groups instead of single foods within each group; for example, instead of choosing brown rice for every meal, consider other whole grains,” says Allison Knott, MS, RDN, CSSD.